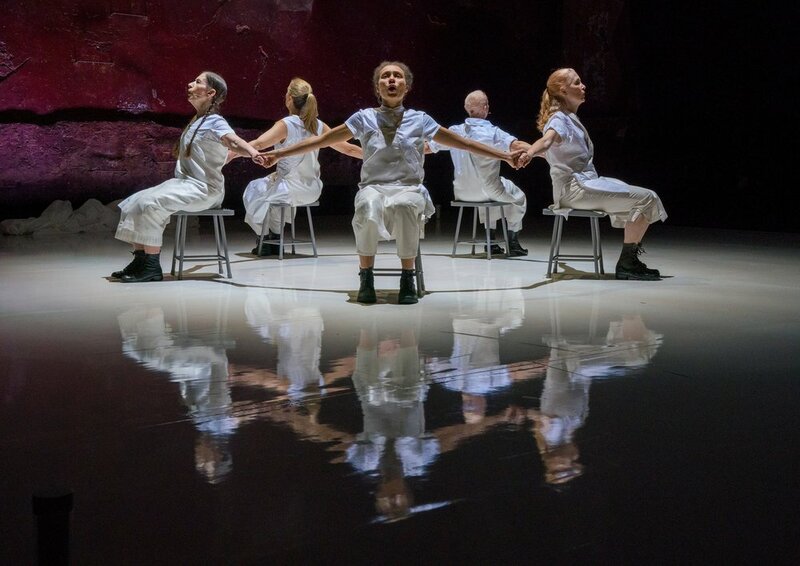 Rave review for Meredith Monk's latest work Cellular Songs at Brooklyn Academy of Music! Gay men are being incarcerated and murdered by the masses in Chechnya. The Trum dministration continues o belittle all minorities with its absurdis media-politic, inciting violence and hate against the LGBTQIA+ communit and so many other. So many peopl, everywhere (America included), have to hide who they are to be accepted into the environment in which they reside. “Somebody to Love” became about what, why and how can we as a community come together and realize that all we are doing is lovin, and giving our hearts so effortlessly to one another. here is a real absurdity to anyone who doesn't understand this, and so I decided to make fun of just how absurd that is. VIDEO OF THE DAY: Latinx musician and dancer José Rivera Jr. reclaimed Queen’s “Somebody to Love” as a queer resistance anthem. In the humorous video, he and a group of LGBT individuals break out of the gay conversion therapy program their families sent them to. "The hilarious but poignant clip sees Rivera fighting his family’s attempts at “converting” him to heterosexuality. "Freddie Mercury is one of the most loved gay performers of the 20th Century, but now one of his most famous songs has been given an LGBT+ makeover. José Rivera Jr has reimagined Somebody To Love with a new visual, transforming it into a rousing queer anthem." Einhorniger (Unicorn) - José Rivera Jr.
"José Rivera Jr. proponuje hit Queen na nowy hymn LGBT." 6-PACK — Abs Man + Political Neophyte + Queen-ing Out + I AM MICHAEL ... But Is He? + Entertaining Mr. Baguth + Oh, Deer! Check out Queen's “Somebody to Love” as a queer anthem for the resistance. The video also features legendary nightlife personality Rify Royalty in the role of Rivera Jr.’s father. Pulp: Arts Around Ann Arbour | Bicentennial Smorgasbord U-M Department of Dance's "Glancing Back, Dancing Forward"
This suite is so effective in large part because of the dancers’ command of Monk’s movement and music. Considering the many other successful dances in Glancing Back, Dancing Forward, the Department of Dance has ample reason to celebrate." All Things Considered host Jami Floyd spoke with Jose Rivera, a 24-year-old gay man of Puerto Rican and Italian descent, for some perspective on the tragedy. The dancer, choreographer and performance artist lives and works in New York City, and said, "They were my brothers, and my sisters, and it was incredibly disrupting to me. It put a fire under me that reminded me why I'm here." "The choreography of Spooner’s work for the New Museum was devised with and is performed by Holly Curran, Maja Ho, Emily McDaniel, Ashton Muniz, José Rivera, Jr., Maggie Segale, and Jennifer Tchiakpe." "Through a video cover version of the song, José 'grapples with his feminine and masculine identities while reflecting on memories of a past lover, seeking to address his own body dysmorphia through physical expression,' per a press release." "...You have to check out this incredible rendition of “When We Were Young” by José Rivera Jr. It starts out with José and his band performing the song together, but then José takes us to the streets of NYC and totally crushes it with a team of dancers around him. It’s seriously straight out of a movie..."
Adele | When We Were Young (Cover) by José Rivera Jr.
"NYC-based Puerto Rican-American performing artist and choreographer José Rivera, Jr. has released a gorgeous, immersive video cover of Adele’s song 'When We Were Young,' directed by Blake Pruitt." “[José says] I create accessible work in a digital, shareable format to inspire change and encourage conversation on how we perceive our physical selves. The response to my live work OF CAKE & VANITY (inspired directly by my dysmorphia) created a dialogue on mental health between friends, family, and me. Seeing live performance is a privilege." "See this NYC performance artist take on Adele’s latest hit." "NYC based artist Jose Rivera Jr. truly shows his choreography talents and emotions in his latest cover of Adele’s “When We Were Young.” Rivera’s high pitched vocals make for an exceptional artist. " "José Rivera Jr. is a director, choreographer, dancer, actor, multi media-performing artist, and knows how to deliver his message. His story, Of Cake & Vanity, is a deeply personal exploration of self...José is an absurdist, referring to his show as a 'Musical Painting.' Unusually accurate words." "When I met José Rivera, Jr., a queer performance artist, he had the same attitude towards sharing, and together we noticed a major lack of openness from many others. We discuss this, and how José’s work further explores these topics, in Episode 3 – Being Candid."